Recently, Admiral Imports put out the following press release regarding its new brands of 'absinth' that will soon be available in the U.S. In the interest of fairness, I've prepared some counterpoints that further explain certain assertions contained within the release. The original release is in regular type, my counterpoints are in bold. 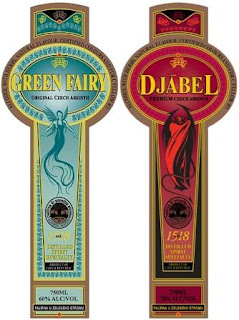 CEDAR GROVE, N.J., March 4 /PRNewswire/ -- Admiral Imports has announced that it has been named the exclusive importer of "Green Fairy," "Djabel," and "Koruna" Absinths from the Czech Republic. The new acquisitions position Admiral Imports to be the leading U.S. importer ofAbsinth. Absinth, a highly alcoholic spirit derived from several herbs including wormwood, contains the chemical "Thujone" which has been surrounded by myths about its effects. Although Absinth production probably dates back to the 1600s, it gained popularity in the early 1900s when cheap industrial producers began artificially coloring it with toxic chemicals like copper and zinc making people sick. While it is true that there were unscrupulous producers who were using adulterants in their absinthes, the more popular brands such as Pernod Fils were producing high quality and perfectly safe product as early as 1805. Literally millions of people throughout Europe and the U.S. drank absinthe on an almost daily basis, without incident. It was the abuse of the product (both high and low quality absinthes) by end-stage alcoholics where the majority of the purported side effects were noted. Many of these people would ingest absinthe straight, not diluted with 3-5 parts water as it should be prepared. Ingesting alcohol of any kind at that potency can cause serious health problems. Poor testing incorrectly linked the thujone to these illnesses. As a result, it became almost universally banned with the exception of what is now the Czech Republic where production continued uninterrupted. In 2007, the ban on Absinth in the U.S. was lifted. Recent scientific studies have revealed that the levels of thujone in absinthe during the Belle Epoque were highly overestimated. Other studies have shown that thujone, which can also be found in common culinary ingredients such as sage, does not exist in high enough amounts to cause any effect, even in those products that have the highest reported levels. While poor testing might have played a part in the banning of absinthe, propaganda and prohibitionist sentiments played just as much of a role. Absinthe, being a high proof, extremely popular product was the perfect target. Using pseudoscience and false logic, the case against absinthe was built, and ultimately led to absinthe’s demise. There were several countries in which Absinthe was never banned, including Spain (Pernod Fils relocated to Tarragona after the ban in France), Japan, the U.K., and the Czech Republic. However, to date, there has been no evidence that Absinthe (or Absinth) was produced on a large scale in the Czech Republic until Rodomil Hill’s company began operations in the late 1980’s or early 1990’s. If this evidence does exist, it has not yet been made public. Absinth is typically green from the natural herbs from which it is produced or from additives and became known by the moniker "la Fee Verte" or "Green Fairy" in English. Traditionally made absinthe comes in two major styles, clear (Blanche or Le Bleu) or green (verte). Clear absinthes do not go through the final coloration step that lends the green color to a ‘verte’. This final step involves soaking certain herbs such as petite wormwood, melissa and hyssop in the clear product, where the chlorophyll is transferred from the herb into the alcohol. There is also historical evidence of a red absinthe that was produced during the Belle Epoque. Surviving examples of red absinthe have not yet been discovered, only an advertising poster for Absinthe Rosinette. Artificially colored absinthes that were produced during the BelleEpoque were commonly viewed as lower quality absinthes, as they were much cheaper to produce. Currently produced absinthes that use artificial coloring see the use of these additives as a way to either make the beverage more attractive (i.e. bright, uncommon colors), or to stabilize the color for the long term. Most absintheurs (experienced absinthe drinkers) recognize that a traditionally colored absinthe will fade or become yellow/brown as it ages, due to the degradation of chlorophyll. This is not viewed as a product flaw, but instead, as a characteristic of a quality product that was colored naturally. Today, this name is the trademarked brand name of the Czech Absinth imported exclusively by Admiral Imports. "Green Fairy is based on a traditional Czech formula which has made it the Absinth by which all otherAbsinth is judged," said David Higgins, Director for Green Fairy Absinth. Green Fairy is 60% alcohol by volume and will retail for a suggested $59. While this product in particular has trademarked the name ‘Green Fairy’, it is a common moniker for all absinthes, which may lead to some confusion to consumers who are looking to purchase French or Swiss Absinthe, as opposed to Czech Absinth, which has a different flavor profile and many times uses different production methods. The two other Absinths being introduced to Admiral's portfolio are "Djable,"[sic] and "Koruna." Djable, [sic] which translates to "Devil," is similar in nose and taste to Green Fairy and is bottled at 70% alcohol by volume with a suggested retail of $64. 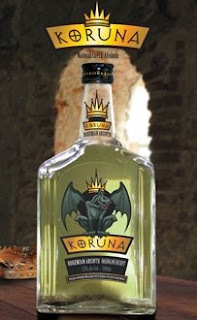 Koruna exhibits different characteristics than Green Fairy and Djabel, contains wormwood leaf sediment in the bottle and is 73% alcohol by volume with a suggested retail of $79. Wormwood (Artemisia Absinthium to be specific) is known as one of the most bitter herbs in the world. Distillation helps to reduce the acridity of wormwood, and leaves only a pleasant, alpine bitterness. Why a producer would let it macerate in the bottle is something of a mystery. Also, there seems to be a small bit of discrepancy. According to their website, wormwood 'bark' is left in the bottle, whereas the press release states 'leaf sediment'. "All three items have less licorice taste than their French and Swiss competitors making them mix well with fruit juices, soft drinks and energy drinks and thus more appealing to mixologists," said Dan Lasner, Vice President of Sales and Marketing at Admiral Imports. The misperception that French or Swiss absinthes do not mix well in cocktails has been aggressively propagated by those that are marketing brands that do not contain anise. While anise is not as popular of a flavor in the US as it is in France, French and Swissabsinthes do indeed mix very well. In fact, one of the oldest cocktails in the U.S., the Sazerac, uses absinthe as an ingredient. There are literally hundreds of cocktails that include absinthe or an absinthe substitute such as Pernod or Anisette, which are built on the anise flavor inherent in aforementioned products. There are those in the absinthe community that would argue that a beverage can’t be considered absinthe unless it has the dominant flavors of wormwood and anise. While there is no current definition of absinthe in the U.S. that mandates certain ingredients or flavors, evidence suggests that all traditional absinthes that were produced during the Belle Époque, which are responsible for making absinthe famous, included both wormwood and anise as the dominant ingredients. Traditionalists will always believe that those two ingredients are what make absinthe what it is. Many would also argue that fennel should be included to make up the ‘holy trinity’, although several historical recipes, while not widely used, did not include it. Admiral Imports represents some of the finest international brands in the world such as Iceberg Vodka, Sheep Dip Blended Single Malt Scotch, Pig's Nose 5 Yr. Old Scotch Whisky, Voodoo Tiki Tequila, Berentzen Apfel, Green Fairy Absinth, Famega Vinho Verde, Luis Felipe Edwards wines from Chile, Royal Oporto, Wines of Real Companhia Velha, Wines from Bacalhoa,Tishbi wines from Israel, Fabiano Wines from Veneto, Fazi Battaglia wines from Marche, Italy, Villa Dante Toscana, Sielo Blu from Josef Brigl, TostiSparkling Wines from Piedmont, Italy, Torlasco wines and much more. To sum up, as with many press releases, this one was meant to marginalize other brands, while at the same time, promoting certain 'facts' that make these specific 'absinths' more relevant.